Action from last season's Checkatrade Trophy tie between Posh and Luton. The Peterborough Telegraph has again teamed up with Checkatrade to offer 20 free tickets to see the Checkatrade Trophy tie with Luton Town at the ABAX Stadium on Tuesday, November 13. Five lucky winners will win four tickets apiece. To enter just e-mail the answer to the following question to alan.swann@jpress.co.uk. The deadline for entries is 5pm, Tuesday, October 30. Win tickets for a Checkatrade Trophy tie. Posh will probably need to win the gamw to go through to the knockout stages of the competition. 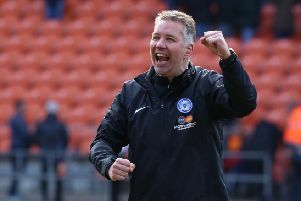 What was the score after 90 minutes when Posh played at Luton in last season’s Checkatrade Trophy? Add your name, address and contact number to your answer. Normal Peterborough Telegraph rules apply.